Actually the figure is twice that when you add in the cost of the oil which has gone from $35/barrel to $138/barrel. This has been a result of the reduced production in Iraq. This would include what has currently been spent on the oil, the effect of this upon the economy. What also is missing is where society would be if budget cuts weren’t brought about by the siphoning effect of both the war on the government budget and that of the oil prices upon the private sector. Money taken from education, housing, and health care would be the principle social cost. The average citizen is spending over $200 more per month for fuel and heating, thus he has less funds for health care, education, housing etc. ; this effects his quality of life. This is the road not taken thanks to the neoliberal administration. Articles abpit Joseph Stiglitz have been posted at the skeptically site since 2006. Firedoglake is pleased to welcome Linda J. Bilmes, co-author with Nobel economist Joseph E. Stiglitz of The Three Trillion Dollar War: The True Cost of the Iraq Conflict. Professor Bilmes is an expert in government finance, a former Commerce Department Chief Financial Officer, and a Harvard Professor. In January 2006, Linda Bilmes and Joseph Stiglitz released their initial study of the costs of the Iraq and Afghanistan wars. Their estimates then -- closer to $2 trillion -- were met with the usual denial and misdirection that have come to characterize the Administration's unwillingness to take responsibility for the consequences of their war decisions. Since 2006 Bilmes and Stiglitz have verified the assumptions (and their conservatism) and updated the results. Most data is from official US sources, sometimes from hidden parts of the budget, with key data extracted from the Administration by veterans organizations via Freedom of Information Act requests. The result is The Three Trillion Dollar War, a stunning and exhaustively documented assessment of the war's massive costs. But there is far more here than a compilation of economic costs. We find an equally valuable treatise about how to think about the economic consequences of waging war, an analysis the Administration didn't do, and still hasn't. We learn how badly our budgetary process works and how shamefully we still treat America's veterans. There is also an intelligent discussion of the merits (and costs) of withdrawing versus staying, a chapter on "lessons learned," with practical recommendations for addressing issues they uncovered in the course of their research. We'll have a chance to ask Professor Bilmes about their suggested reforms. Many FDL readers are already familiar with the $3 trillion figure, having read the authors' op eds in the Washington Post, The Times, or other publications or read about Stiglitz' Congressional testimony or heard Linda Bilmes interviewed on NPR's Fresh Air, which details the bureaucratic hurdles soldiers face transitioning from active duty to the Department of Veterans' Affairs. And that's a clue to the book's larger value. It is relatively straight forward to add up the annual Congressional authorizations, now approaching $800 billion through 2008, and to extend those into the future under different scenarios. But to assess the full costs of the Iraq war the authors had to unearth hidden parts of the war's costs buried outside the "emergency" budget requests the Administration uses to keep most costs out of the usual budget process. How much will it cost to "reset" the military, replacing/repairing all the equipment that has been lost? 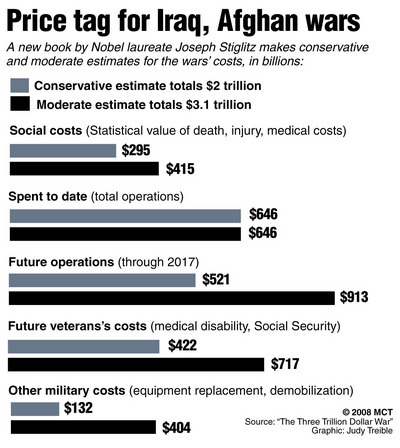 How much will it cost for the Veterans Administration to deal with the types of injuries our soldiers are receiving in Iraq, from amputations to brain injuries and PTSD? The well-known $3 trillion figure is the total for the authors' "realistic-moderate" scenario (a "best-case" scenario is about $2 trillion) which assumes a substantial US occupation for several years. The authors start with the $645 billion budgeted so far (with $200 billion more requested this year) and adds the expected costs of future operations ($913 billion), the future costs of taking care of veterans' medical needs and disability payments ($717 billion), and other hidden costs to government ($404 billion). To that $2.68 trillion subtotal, the authors reveal another $415 billion in "societal costs" (value of death and injuries, etc) to get to $3 triilion for that scenario. A Congressional study by the Joint Economic Committee found that the sums spent on the Iraq war each day could enroll an additional 58,000 children in Head Start or give Pell Grants to 153,000 students to attend college. Or if we’re sure we want to invest in security, then a day’s Iraq spending would finance another 11,000 border patrol agents or 9,000 police officers. Most Americans have yet to feel these costs. The price in blood has been paid by our voluntary military and by hired contractors. The price in treasure has, in a sense, been financed entirely by borrowing. Taxes have not been raised to pay for it - in fact, taxes on the rich have actually fallen. Deficit spending gives the illusion that the laws of economics can be repealed, that we can have both guns and butter. But of course the laws are not repealed. The costs of the war are real even if they have been deferred, possibly to another generation.